Special time is quality time spent playing with each of your child every day. It is not time spent sitting in your child's company while she plays and you do something else. It is not the time you spent supervising your child's play nor is it the time you spent taking your child to outings. It is time spent doing what your child does in her play and giving your child your full attention. This is true connection. We parents can get so busy in a day that we're not present with our child. We may be with our child physically but we may not be there mentally. This is why special time is so special. It allows us to connect with our child doing the things that she loves and chooses to do. Whether your child is a toddler or teenager, special time works for all ages. Read on to find out the conditions for special time to work. Don't get me wrong. All those other times you spend with your child, taking her on excursions, supervising her and being near her, are important as well. Your child needs you to be there for her as much as possible. But she also needs Special Time with you every day. It is through being mindful and present that the connection between you and your child strengthens. 1. One-on-one with each of your children. Make sure that everyone knows that when you're in Special Time with one child that you are not to be disturbed. 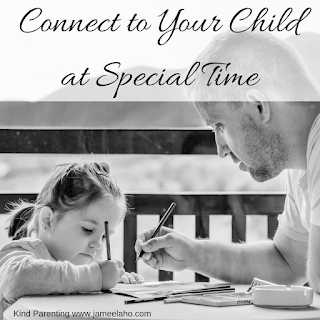 Each child has to know that they will all have their Special Time with you. 2. Special Time only requires 10 minutes but make sure you do them every day. 3. Your child chooses the activity that you both do. If your child is young and can't decide on what to do then have about 3 choices on display and have her choose from those choices. 4. Your child leads the play and you follow. This means that you do what your child does. If she chooses to have a tea party with her dolls then this is what you'll be doing. It also means that you don't take over and start leading the play and tell her what to have at the tea party or what to do or suggest ideas. It' s her tea party and she's the boss. 5. Give positive feedback on what she's doing. In other words, describe what she's doing. "You're sharing your cake with Miss Polly and me" and "You're trying new things". 6. Use active listening. This means that you paraphrase what your child says or say it in another way. If she says. "Mummy, you have to eat this cake" then you say "You want me to eat this cake". Active listening shows your child that you're paying attention. 7. Make no judgements, criticisms or give instructions. Don't ask questions such as "Why did you do that?" or "Isn't it better if we do this?" Special Time is positive quality time so no negativity is allowed. Schedule in Special Time with each of your children today!